Want to cuddle with Nellie? Do you feel isolated, lonely, stressed? Are you longing to feel connected, to receive, to feel heard? Do you want to overcome shyness to feel confident in communicating the touch you want? Would you like to nurture your inner child? These are just some of the reasons people choose to work with me. 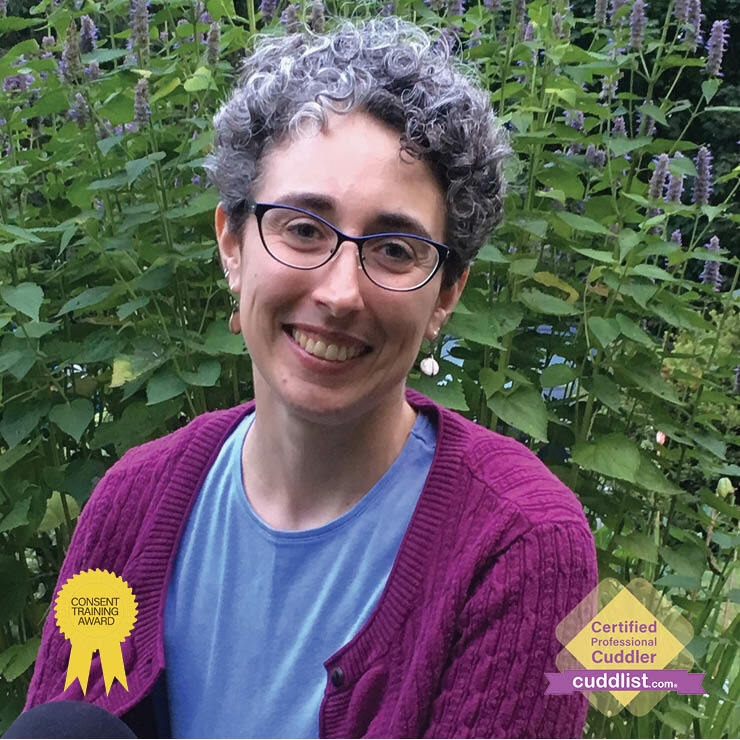 With a background in massage, coaching, and integrative health, I offer a combination of touch, listening, and communication skills to support you in tuning into the kind of platonic touch and connection you want. Sessions are tailored to your individual needs and desires. They can be deeply relaxing, playful, healing, open windows to personal growth, and more. Laughter and tears are welcome, boundaries and consent are deeply honored, awkwardness and changing your mind are celebrated, and there’s no “right” or “wrong” way to experience platonic touch and connection. I work with people of all genders, races, sizes, abilities, and sexual orientations, and specialize in supporting people with chronic illnesses and disabilities. It is an honor to be present with you no matter what’s going on for you and offer nurturing touch and connection that is lacking in so many ways in our culture. 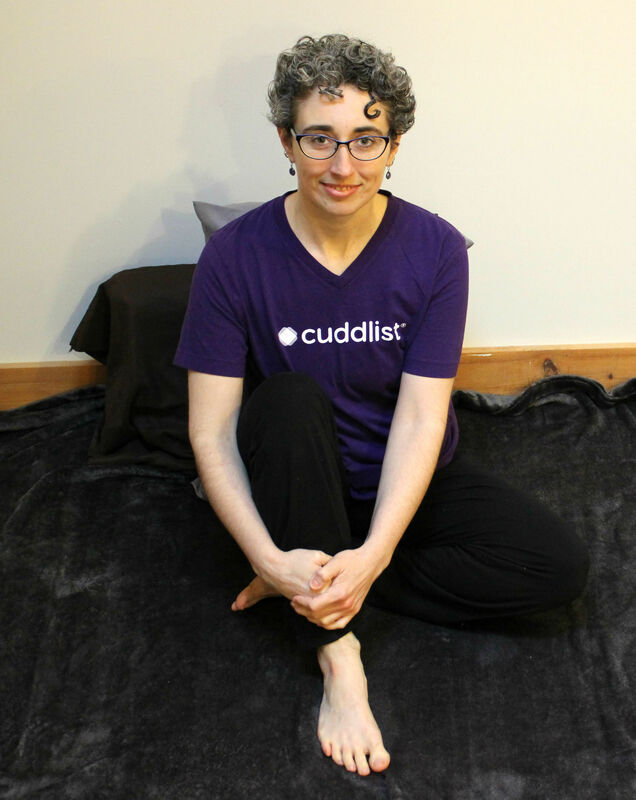 To learn more about my journey to becoming a Cuddlist check out this video where I talk with Cuddlist Co-Founder and Director of Training, Madelon Guinazzo. You can also check out my Facebook page to learn more about my work and the importance of cuddling and touch in general. 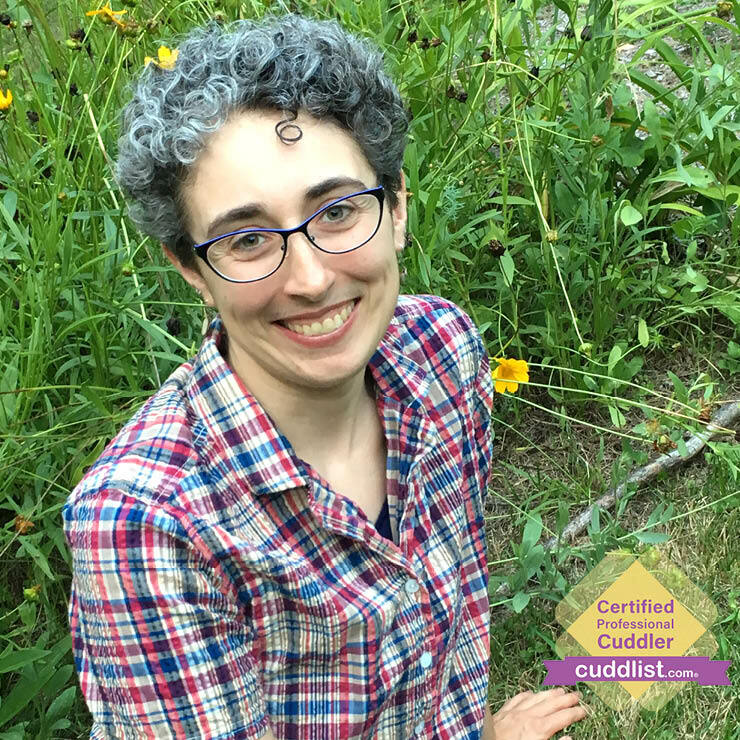 “With almost no cuddling experience in the past, I was terrified going into the first session with Nellie. That fear didn’t last long. Nellie was very sweet and gentle and helped me feel safe in exploring touch. I like how cuddling with Nellie can be relaxing, like when she plays with my hair; make me feel protected, like when I’m all wrapped up in her arms; or be super goofy, like when I ask if she’ll rub my belly as if I were a big dog. Nellie is very easy to talk to and very easy to share quiet space with. Cuddling with Nellie has been a life-changing experience and I’m so grateful for her caring.” – R.L. “Cuddling has proved to be the perfect complimentary therapy for me. The good safe touching at the hands of Nellie has allowed me to begin rebalancing my stark Catholic childhood with a more creative, kinder spirit. I also feel that [oxytocin and other feel-good hormones] created during this process are indispensable to my recovery. Thank you Nellie.” – C.P. “I have been a cuddle client of Nellie Wilson since December. Very early on she recognized and welcomed my “adult/child” side. I think what I see as her best consistent skills have been her story telling, reading of children’s stories, and she often sings to me with her beautiful, playful singing style. When the session is over, I can’t help but to look forward to the next session.” – S.C. I will email you to schedule a free phone consultation to see if I am a good match for what you want before booking a session. I will go over the code of conduct, answer any questions or concerns you may have, and collect some basic information from you. The first session is 60 minutes and is a time for us to get to know each other and explore what you want to get out of your Cuddlist session. Future sessions can be up to two hours in length. Please note: I do not offer same day appointments or overnights. For allergy and health reasons, I cannot work with people who use tobacco products/cigarette smokers and ask that you please refrain from wearing any scented products including: aftershave, cologne, perfumes, scented shampoo/soaps/lotions/essential oils/laundry detergent, incense. A good resource on how to be scent-free can be found here. I’m also happy to answer any questions or concerns you may have. I see clients at my private office located in Easthampton, MA. For those who are not able to travel because of chronic illness or disability, I offer home visits within approximately a 30-minute radius from Northampton, MA at no additional charge. Please indicate if you are looking for a home visit session and we can discuss if that option is right for you. I accept payment via cash or check at the beginning of the session or via PayPal in advance. Please note that I have a 24 hour cancelation policy. I typically see clients during the day on Tuesdays and Fridays, evening sessions on Wednesdays and Thursdays, and morning sessions on Saturdays.